Hulu released a teaser trailer for season 3 of The Handmaid's Tale, showing handmaids gathered in Washington, DC. Twitter shows us more. A haunting teaser trailer was recently released for season 3 of "The Handmaid's Tale," showing hundreds of handmaids gathered in Washington, DC in what appears to be a protest. The story is an extension of that in Margaret Atwood’s book of the same name. As noted by Lad Bible, these chilling words were heard in that trailer: "We were asleep before. Now we're awake." Judging by the images below, the handmaids are awake indeed and are protesting against the dystopian circumstances under which they are forcibly raped to produce babies for the commanders' barren wives. That trailer is included here. "The Handmaid's Tale" season 3 is set to air on Hulu in the US on 5 June 2019, and it is expected that it will air on Channel 4 in the UK soon after. 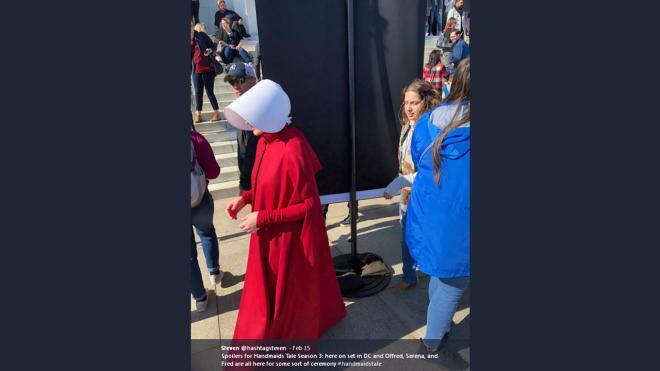 While it was a teaser trailer, the producers and Film crew couldn't exactly hide their film set in Washington, DC, which shows the handmaids gathered in their hundreds. In the image at the top of this article, it can be seen that the Washington Monument has been converted into a giant cross. Kenneth Vogel of The New York Times commented on the perfect timing of the filming, as it took place on the same day US President Donald Trump declared a national emergency over his border wall desires. Funnily enough, the show is about a totalitarian regime toppling the US government after the army had declared a national emergency. 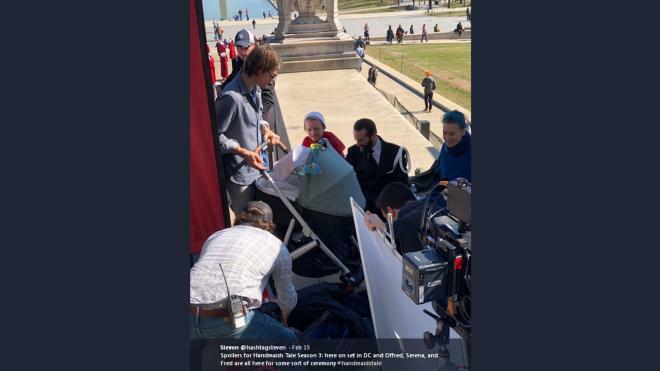 Refinery29 reports that many images soon appeared on Twitter of the filming of season 3 and some are included below. Offred/June (Elisabeth Moss), Commander Fred Waterford (Joseph Fiennes) and Serena Joy Waterford (Yvonne Strahovski) look like they are the best of friends on the film set. Obviously, it is a different story in the series. One of the handmaids is seen here from the side and it is probably Offred/June.